Get Emergency Air for Bike Tires…with the Help of a…GASP…CAR. New bike riders often boast an exuberant sense of freedom once they start hitting the streets. “This city is so navigable! It feels so much smaller!” Talk to them after they’ve had their first flat and are left stranded fifteen miles from home you’re bound to hear a different story. Enter the emergency bike pump – naturally, one could go down a row of cars and show them who’s boss, or, take the high road and politely ask to borrow some air from a passing car. Woah there people. Assuming that you do get permission from the owner of the tyre before relieving it of some air and that the tyre wasn't under-inflated to start with, then taking some air shouldn't grossly affect the car tyre's pressure as the volume of most car tyres are significantly greater than most bicycle tyres. Yes, it'll reduce the fuel efficiency but not significantly and unless you let out all the air or were driving close to the edge of performance, most drivers wouldn't be able to tell the difference. The biggest issue is that the bike tyre is going to be seriously under-inflated (recreational bike tyres would be ~60-80psi, road/racing bikes are ~100-120psi) so you'll do more damage to the bike tyre. wow, promoting ungreen stuff because it's apple branded, now advocating waste, theft and vandalism? you guys have fallen a long ways. aside from the impracticality of it, this will directly *reduce* the fuel effency of the car making the entirething directly ungreen for the quasi convience of one person. you're also promoting something that will make drivers less able to control their vehicle, possibly sending them into another car or worse bike if they have a sudden flat from driving with too low pressure. i think an appology to your readers is in order. To reiterate what elb said, this is irresponsible and potentially dangerous. Moreover, bicycle tires usually require ~100 psi while car tires are usually inflated ~35 psi. Why would you even post something like this? I am very disappointed by this post, for several reasons. If you ask permission to take air, fine. Suggesting that it's OK to not do so, though... 1) If you're good, fast, and careful, you won't remove enough air from a *properly inflated* car tire to create a dangerous condition, but if you're slow or the car tire is underinflated, you might. Even if you're good, you could be creating a recipe for unbalanced tire wear, which is not only placing a burden on the car owner, but will cause that giant car tire to have to be replaced *sooner*. The car owner who doesn't know to check the tire may not do so for some time. 2) Your bike tire lost air for a reason. Obviously portable pumps are stopgap to begin with, but in this case, you're not going to be able to inflate a street bike tire to anything like its normal operating pressure, so it's going to be too flat to ride on again Very Soon. A portable pump will allow you to build more pressure, buying more riding time. 3) It probably won't work (but that's pretty common on Inhabitat, I don't know why I bother to point it out). As mentioned in 2), you probably won't be able to get more than 35-40PSI from small car tires, and far less from (consumer) truck tires. Your street bike tires probably require twice that, and might require as much as three or more times that pressure. You can ride on less, of course, but it really didn't replace a pump. #1 is the real kicker. It's dangerous and irresponsible. 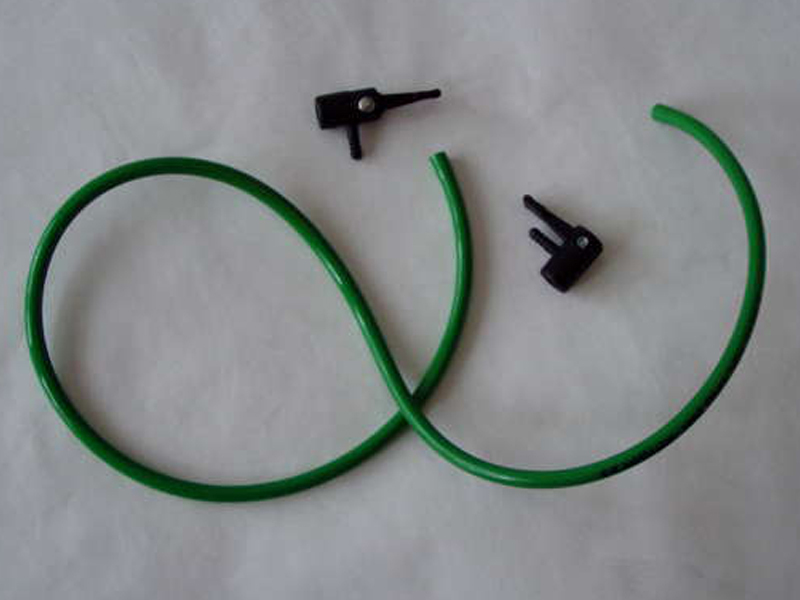 Components of the automatic bicycle pump -- a hose and two chucks. Automatic bicycle pump using a hose and two chucks. Bikers, fear the flat no more -- those days of cumbersome packs with oversized pumps may be behind you. In the spirit of some other resourceful bike tricks like the Aquaduct Bike and the Airbag "Collar," Instructables shows how you can build a pump to siphon air from car tires to fix a flat -- all you need is a 50-100 cm long air hose and two chucks.